Story and Photos by Grace Dickinson KALE IS FINALLY GETTING the spotlight it deserves. No longer just a garnish, the leafy green is now an A-list celebrity in the vegetable world, and everyone wants a leaf of it. For the food bloggers, kale is the addition that sends their mac and cheese to the top of the search engine charts. For President Obama, it’s the garden-sourced salad gracing his Thanksgiving table. For the health conscious it’s a crispy baked alternative to the potato chip. And for local chefs, like Citron and Rose’s Yehuda Sichel (see below), it’s more than a side dish, starring in salads and stews, or as a replacement for parsley in tabbouleh. Kale is everywhere, and for good reason, too. 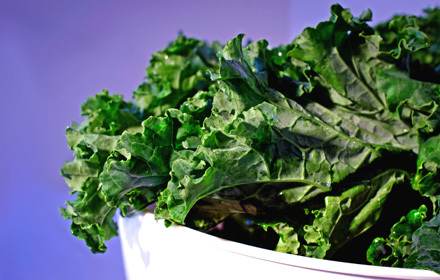 This antioxidant superstar can grow until spring, often able to withstand the winter weather, Even if temperatures drop lethally low, kale will still thrive in local greenhouses, making appearances at year-around farmers markets, like Chestnut Hill and Suburban Station, or at co-ops like Weaver’s Way, which sell local produce. Roxborough residents will even find local kale at their neighborhood ShopRite, which is where this month’s farmer Addison Vawters sells many of his crops. Kale is one of the most nutrient dense vegetables. One serving (one cup) weighs in at just 35 calories, delivering 200 percent of your recommended daily value of Vitamin A and more than 100 percent of the needed Vitamin C. It’s also packed with Vitamin K and potassium, and is considered a good source of calcium, iron and folate. For the freshest kale, look for leaves with a dark green hue, and avoid discoloration, such as yellowing or brown edges. Curly varieties, like Siberian and Scots kale, should hold tight curls. Droopy or limp leaves indicate too much time spent out of the ground. The smallest leaves will have the most tender and mild flavor. This kale salad (belwo) is one of Sichel’s favorites, and draws on the classic Jewish pairing of salami and eggs. (Vegetarians can swap the salami for grilled Portobello mushrooms.) For this all-in-one meal, Sichel suggests a festive champagne or sparkling white wine to complement the smoky notes from the secret ingredient: paprika. For more of Sichel’s kale creations, head over to Citron and Rose where dishes like the ribeye are served alongside a white bean stew brimming with braised kale. In a large mixing bowl, combine kale, shallots, red wine vinegar, paprika and salt, to taste. Set aside. Heat olive oil over medium high in a medium-large sauté pan. Add salami and turnips, and sauté until crispy. While cooking, bring a large pot of salted water to a slow simmer. Swirl the water with a spoon and drop eggs into the pan, one at a time. Cook for about three minutes, until eggs are set. Once the salami and turnips are crisped, immediately add entire contents of pan to the kale mixture. Toss salad, and distribute evenly between four plates. Finish with one poached egg on each plate. Garnish with salt, pepper, and chopped chives or parsley, if desired. * For a vegetarian version, swap the salami with one cup of 1/3-inch-sliced Portobello mushrooms. Marinate the sliced mushrooms with 4 chopped garlic cloves, 3 tablespoons of olive oil, 1 tablespoon of balsamic vinegar, salt and pepper (a few generous grinds around the bowl), for 15 minutes. Place on hot grill/grill pan, and cook 5 to 8 minutes on each side, or until tender. 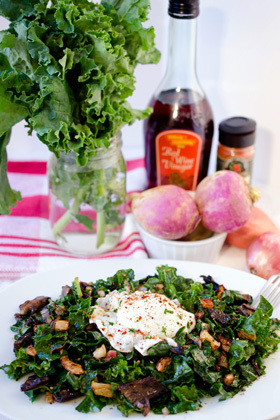 Chop and add to bowl with kale and turnips. To freeze, blanch briefly (45 to 60 seconds in boiling water), wring out the water and portion it into freezer bags. Press to remove the air and freeze. For truly convenient storage, powdered kale is best. Wash, dry and bake at 400 degrees until crisp. When cool, pulverize in a blender. Use in soups, smoothies and sprinkled over popcorn. For pasta lovers there’s kale pesto. Replace half the basil in your favorite pesto recipe with kale leaves (no stems). It keeps seven to 10 days in the fridge and up to a year frozen. Canned kale is terrible, but the other methods listed above leave you with something delicious that will keep for a long time.